This link was sent to me by Jonas Andersson--thank you! The video shows a Swedish Wagon Maker making the parts for a wagon wheel. Notice that he seems to be using regular chisels and gouges (short-handled) on his lathe, how quickly he shapes the spokes with hand tools between huge pinch dogs, and how he applies glue to the tenons. Very cool video. Enjoy! 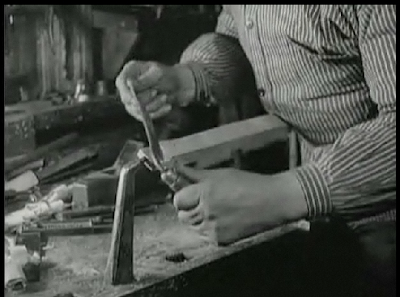 In case you missed the other film on Swedish woodworkers (posted earlier), click here.